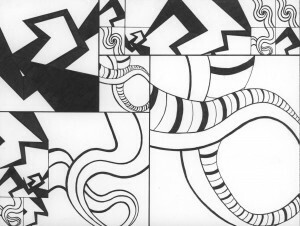 Problem: Create black and white compositions using a variety of marks to demonstrate an understanding of visual rhythm, repetition, and pattern. These compositions will attempt to visualize sounds and uncover the relationships between what you hear and what you see. Materials: Creative Process Book, pencils, inking pens, Bristol Board 9×12″, Bristol Board 14×17”, old newspaper/magazines, scissors, exacto knife, ruler/t-square, glue. Technical Skills: thumbnail sketching, mark-making, draughmanship with ruler/t-square, inking pens, exacto knife and collage. Listen to your favorite piece of music. Imagine what the sounds and patterns you hear look like and consider how they relate to each other. Describe them in terms of pattern, line, shape. Consider how some sounds repeat to create rhythm. Create a new blog post called Sound Visualizations: Phase 1. Once you have created a total of 6 strong patterns (3 Staccato and 3 Legato) move on to the next step. Refer to class pattern examples for ideas. Mashup: On 9×11″ Bristol create 1 final inked composition using 1-2 Staccato and 1-2 Legato pattern squares. 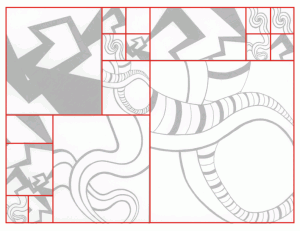 Even though the composition will be a field of pattern, it should feel unified. You will unite two rhythms (Staccato and Legato), like a DJ mixing parts of different songs. Before you begin working, make a layout and think about how you will arrange your different patterns on the page. How will they relate to each other? Will the pattern squares complement each other or repel each other? What will it sound like? Some squares should be larger, some should be smaller, all should repeat at least twice. Create a new blog post called Sound Visualizations: Phase 2. Scan your finished Staccato / Legato Pattern Mashup (300dpi, grayscale). Save this hi-res file as FirstInitalLastNameMashupHIRES.psd. 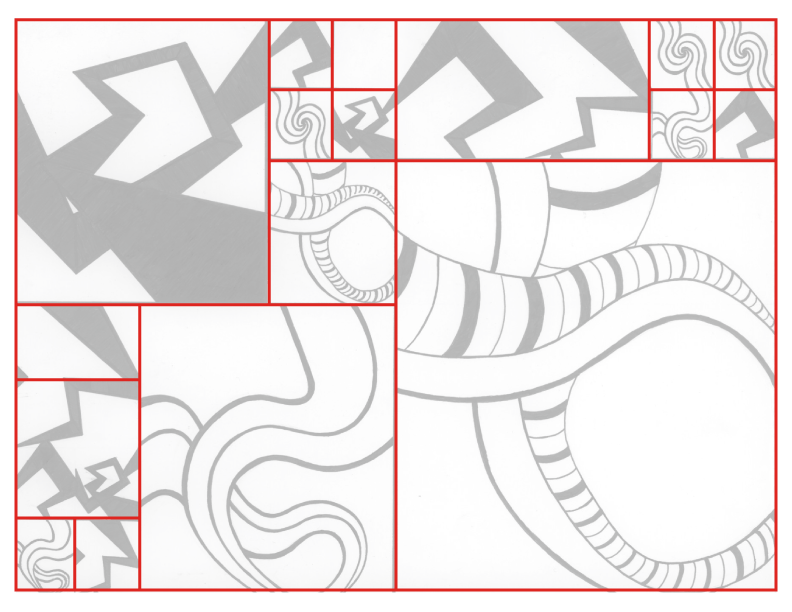 Using the slice tool, slice up each pattern square for use in your animation. Use the free online software Animatron to create a short animation and audio mashup using the two songs with Staccato and Legato rhythms. Use Summertime and Another One Bites the Dust, if you wish. The songs you choose should demonstrate, very clearly, these two rhythms. Instructions to be added to the class 10 outline. Create a new blog post called Sound Visualizations: Phase 3. Create a new blog post called Sound Visualizations: Phase 4.